What can we expect from wide receivers entering their second seasons? Will it be a repeat of the previous season, or will they improve upon the things they learned as rookies? Perhaps they found success right away and will actually see a decrease in production. Will these players be sophomore duds or sophomore studs? For the second installment of this series, we are looking at the wide receivers taken in the second round of the 2017 NFL Draft. For the first-round wide receivers, click here. In his 2017 rookie season, Zay Jones was the most targeted Bills wide receiver, but that was basically where the success ended. He caught only 36% of his targets, which is horrible. For reference sake, a common criticism of Buccaneers Mike Evans is his low catch rate, which is 53% for his career. That leads us to wonder: why was Jones’ catch rate so low? For starters, Jones played the majority of the season lined up on the outside. Once Sammy Watkins was traded away, Jones became the team’s best deep threat due to his speed. In his Reception Perception study of Zay Jones’ college film, Matt Harmon found that he had an average success rate vs man coverage and a below average success rate vs press coverage. This, coupled with a below average contested catch rate, leads to believe that Jones is best suited to be a slot receiver. Unfortunately for Jones, things are not looking up in 2018. They did not bring in any other WRs who are considered deep threats. Early indications from depth charts have Jones listed as a starting outside WR. He will probably suffer through another season with a low catch rate unless he drastically improves his abilities as an outside receiver. A significant improvement seems unlikely, considering the fact that he had both shoulder and knee surgery this offseason. Worsening the outlook for Jones is the fact that Bills lost quarterback Tyrod Taylor in the offseason. Whether the rookie Josh Allen begins the season as the starter, or the Bills deploy either AJ McCarron or Nathan Peterman, I believe that the QB situation will be worse in 2018. The only element that may assist Jones is the fact that none of the Bills current quarterbacks are as good at running the football as Tyrod Taylor. Most likely, the team will increase the number of pass attempts and Jones will probably see at least a dozen extra targets. However, even with an improved catch rate, and yards per catch, I do not project anything more than a minor increase in production. Curtis Samuel has always been a difficult player to project. Coming out of college, the football world was not entirely sure if he would be a receiver or a running back. The Panthers selected him (as a WR) in the second round of the same class as RB Christian McCaffrey. McCaffrey found success while tying for the team lead in targets. Samuel, meanwhile, battled with injuries just as he was beginning to establish himself as a reliable target. The question now is: how will he perform in 2018? The Panthers have continued to invest in the passing game by drafting WR D.J. Moore in the first round of this year’s draft. I expect the Panthers will increase upon the 501 passes they attempted last season. I estimate something closer to the 545 passes thrown in 2014, a year when Cam Newton had offseason ankle surgery. After suffering a knee injury in last year’s playoffs, I believe the Panthers will somewhat limit the number of times Newton runs, in order to better protect him. The next question we must ask ourselves is where will all of these targets go? The two most likely candidates to lead the team in targets are the RB and TE: Christian McCaffrey and Greg Olson. Both will probably see around the 113 targets that the former got last year. As for the WRs, Samuel will be no higher than third on that totem pole. I estimate that both Devin Funchess and the rookie Moore will see between 75 and 90 targets. With around 400 targets gone from the projected 545, that does not leave too many to go around for other players. My guess is that Samuel will see around 50 targets, with a slight increase on his catch rate. The other aspect of Samuel’s production is his rushing ability. The Panthers only had him run the ball four times (all were sweeps) but he gained 16 yards per carry. I believe that they will double, possibly even triple, the number of times they run sweeps with Samuel. His biggest limitation, however, is the amount that Newton runs in the red zone. Couple that with expected red zone work of newcomer C.J. Anderson, Samuel probably won’t see many goal-line carries. As for end zone targets, he is again no better than fifth on the totem pole. I think he is too talented to go another season without scoring, but I do not expect a high amount of touchdowns. JuJu Smith-Schuster was the best rookie WR last season. On a high scoring Steelers team, he was second in passing yards, even though he was fourth in targets. Now, Martavis Bryant has been traded to the Oakland Raiders, and his potential replacement comes in the form of a rookie: James Washington. 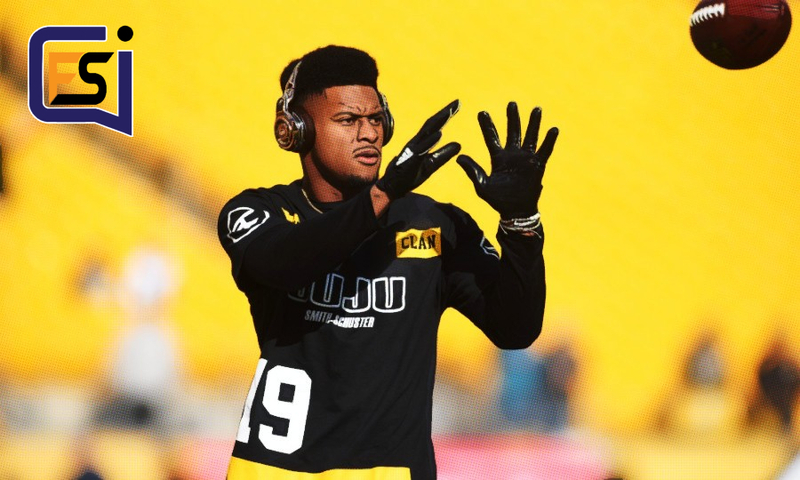 The offense will continue to run through Le’Veon Bell and Antonio Brown, but I believe that JuJu will establish himself as the clear third option. Over the last five years, the Steelers have averaged 591 pass attempts per season. With that much passing, there is a chance that three players may surpass 100 targets each. Word out of training camp is that JuJu will play outside as well as in the slot. In an interview with TribLIVE, JuJu said that he prefers playing in the slot, and Ben Roethlisberger will probably agree with him once the season begins. I think a target increase for JuJu is very probable. There you have it. I believe that Zay Jones and Curtis Samuel will each be closer to a sophomore dud than they are to sophomore studs. Obviously, anything can happen, but I do not think their teams have properly set them up for success, especially Jones. Meanwhile, JuJu Smith-Schuster has a decent chance at being the highest scoring second-year receiver in 2018. He is someone that I would draft with confidence.